This week I reached a milestone that means a great deal to me. On Tuesday, I finished recording the final lead vocal for the long-awaited James Dempsey and the Breakpoints album. There is still work to be done—some backing tracks to record, final mixing and mastering of each song—but all the lead vocal and core instrumental recording is now complete. This album is the realization of a dream fourteen years in the making. As you might imagine, all of this has me on a sort of euphoric emotional tilt, bouncing from joy to gratitude to relief to excitement and even fear. There’s a real sense of joy towards the end of a long journey when the destination is finally in sight. An exuberant psychic “Land Ho!” rings out through your entire being. This journey began with writing that very first song fourteen years ago. I had always hoped to get the chance to record my material and record it well. It’s been amazing to have the opportunity to take the time to produce a fully realized version of each song. Listening to the rough mixes, I am incredibly happy with the results! I usually reserve my exclamation points for tweets and exhortations, but wow! I am absolutely beaming! I can’t wait to get these tracks out into the world! I am very grateful to everyone who lent their time and talents to the album. Having the privilege of working with some wildly talented musicians on this effort has been humbling—as has been witnessing them add their own magic to the songs I’ve written. A dozen or so musicians have contributed to the album. Among them are three who perform on the lion’s share of the tracks: Gordie Freedman (@modenaboy) on guitar, Darren Minifie (@minofifa) on bass and our producer Russell Bond (@russell_bond) doing all sorts of percussion and drums. Hearing the tracks, it’s often the little things that make me smile the most—a guitar riff from Gordie, a subtle bit of bass from Darren, a drum fill laid in by Russell. For a sampling, you can check out their handiwork on our single, Almost Dropped My iPhone, but just wait until you hear what they’ve done on the rest of the album! This milestone also brings with it a sigh of relief—there were a few times when it felt like this project might stop dead in its tracks. Three months into recording, the studio building’s owner dealt a harsh blow. The building was sold and The Annex Studios had thirty days to vacate the premises. After a nearly 40-year history, the beautiful space where we were working on the album was suddenly no more. 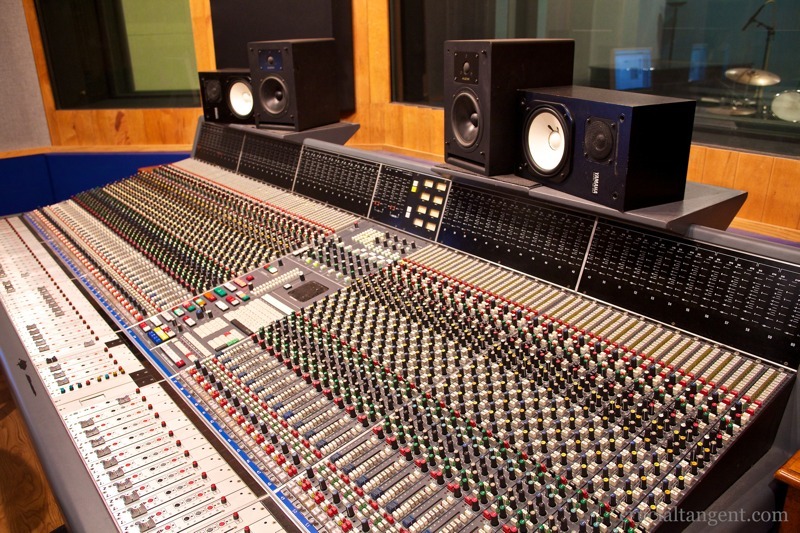 Our first single, The Liki Song, was the last thing recorded at The Annex Studios before it was dismantled. This derailed progress on the album, but much more disheartening was watching our friend Russell go through this major upheaval in business and life. And now, a big part of the relief I feel is knowing that he emerged from that tumultuous time with his well-being intact. As for the album, after a hiatus, we resumed recording at HowlingPoint Studios, high up in the Santa Cruz mountains. This is Russell’s in-home studio, a much more intimate space. Gone is the giant mixing console, but now Julius the studio cat keeps us company while we make our music. I know that I won’t breath that last sigh of relief until the album is up on iTunes, but this week I’m feeling great. Julius the studio cat, listening to the meow mix. It’s an understatement to say that this week I’ve been experiencing a lot of excitement and a healthy dose of fear. This time of year always gets my adrenaline pumping—anticipating the barrage of WWDC announcements, prepping for the big show on Wednesday night (details here), looking forward to seeing old friends and making new ones. And now, knowing how close we are getting to release throws all of that into overdrive. I’m so excited by how it is progressing, it’s hard to contain myself! But there’s also that fear. Over the years I’ve written a bunch of code and now I’ve written and recorded a bunch of songs. What I’ve never done before is promote an album. My fear is that I will not succeed in getting the word out to the wide world of iOS and Mac developers who might enjoy the fun of this album. I am very open to thoughts, suggestions or any opportunities to spread the message. Feel free to tweet them at me or, better yet, email me at info@jamesdempsey.net. And, of course, when the album is released, if you enjoy it, please don’t keep it to yourself. Let other developers in on the fun. When James Dempsey and the Breakpoints play live near WWDC, sometimes things progress beyond the sweet sounds of nerdy, nerdy music. Last year, a new event appeared on the conference schedule—WWDC After Dark. A little investigation turned up some interesting results, which, judging from the audience response, the crowd thoroughly enjoyed. As we get ready for this year’s big show on Wednesday night, June 4th (Full Show Details Here), here’s a little bit of fun from last year’s concert. Come out to Live near WWDC 2014 on Wed, June 4th at 7 PM! Bring your friends, we’d love to see you! Download event to your calendar.